Warning: when installing a new operating system, always make sure to back up your important files from your hard drive, and disconnect any removable USB drives that you don't want to install the OS onto! When dealing with partition tables and formatting to install an operating system, it's possible to accidentally wipe out partitions that you didn't intend to and you'll lose all your files. Back up anything you don't want to lose first, and I recommend disconnecting any USB hard drives to keep them far away from the disk partitioning process. This information is ridiculously hard to find on the Internet. I was playing with Chromium OS using the Lime build provided by Hexxeh. The Lime build is the same as the Vanilla build (i.e. upstream Chromium source code built daily), but it has more driver support, and it's the only build that works with the wifi on my Dell Mini 9. Getting it onto a flash drive and booting from it was easy enough just following the directions on Hexxeh's site, but actually installing it to the hard drive was a bit more difficult. It was hard to find any up-to-date information online; most bloggers were talking about Hexxeh's old "Flow" builds, so the instructions were outdated. When I specifically googled how to install the Lime build, I was still finding outdated instructions. Everyone was saying that you just hit Ctrl-Alt-T to get a shell prompt, and run the install command. Not that easy. The only way I could get into any form of text mode was by hitting Ctrl-Alt-F2 (which I only knew to try because I'm a Linux user). But this got me into a text mode login prompt and it took me a while to figure out the right username/password combination. The username is chronos and the password is facepunch. After that, I was stuck in a really primitive shell that doesn't support anything I'm used to (not even ls), so I went out on a limb and tried running the command bash (which got me into a more familiar Bash shell). But the install command was no good in Bash -- it was running the GNU install command instead of the one to install Chromium to the disk. After some more tinkering, I found that if I ran crosh (Chrome shell) and then run the install command from there, it did what I want. So, I was finally able to install it to disk. It didn't end up working out though. The system doesn't boot after installation. Oh well. But hopefully this blog post will help others find out how to install the darn thing. Boot it from the USB drive. Push Ctrl-Alt-F2 to get to the text mode login. On the first boot from the USB, wifi drivers weren't installed, so I couldn't get past the first screen. Ctrl-Alt-T doesn't work here, so I had to use Ctrl-Alt-F2 to get to the text mode login prompt. The text mode log-on is chronos / dell1234 (the "dell" user didn't work). Then I was able to start bash and then execute /etc/install_wl.sh to install the wifi. Interestingly, the UI of Dell's image looks different to the Lime and Vanilla builds. The Lime and Vanilla builds had what looked like a sort of primitive desktop (complete with a wallpaper), and the Chromium browser windows could be resized and moved around the screen. Where you'd expect the task bar to be on a Windows system, was what looked more like the Mac dock, with icons representing all your opened Chromium windows (plus a couple other icons, one that brings up a menu and one that has the Chromium icon and didn't appear to do anything). Dell's build looks more like the Chrome OS I've always seen screenshots of, so I think maybe the Lime and Vanilla builds are customized a bit (or else it's just a super new UI change and Dell's January image isn't up-to-date enough). There are 90 comments on this page. Add yours. Finally somebody with good UPDATED information on this topic. Worked like a charm on my Dell e6410 laptop Vanilla build. I was stuck on finding the correct login/psw for localhost but nobody had that information out there. Thankfully you had all the info I needed to make it work. I agree with "This information is ridiculously hard to find on the Internet." I wish I found your site sooner. I -was- trying to find a way to get the Hexxeh installed on either a Dell D620 or a D830. I am running into the same issue on both machines, the Vanilla does not see the wireless or Ethernet, and the Lime flashes the Chrome logon screen then reboots. I downloaded the ChromiumOS_x86_Jan3_2012.img.gz that worked for Ethernet on the d620. Wireless still does not work on my Dells, but I am happy for for tonight, thank you for that! Now that I have a taste of ChromeOS tomorrow I will be searching to get the WiFi working. I have Zero Linux knowledge so I expect it to be quite the day from what I have seen. Thanks again! This worked great on my HP laptop as well. Thanks, YOU ROCK! Sigh I keep getting OS Not Found when I try to boot. The only way I deviated from the instructions was that I used an 8G and not a 4G USB. I tried writing the USB from two different LINUX boxes, a Mac, and Windows 7. Anyone else have this issue? I am having a problem booting from hdd. It boots up just fine from USB but after I install it, shutdown, remove usb, and turn it back on, a blank screen appears. It seems that recent builds of Chromium (after February 2012) don't work properly when installed to the hard drive. So, either find an older build that does work or cross your fingers and wait for the Chromium developers to fix this problem. did as stated above and all works well! Seeing how the dell user never worked for me, I logged in using my gmail account (had to plug in network cable first time, then got WiFi working), install seemed to work fine (used dell1234 password) but when I reboot without the USB stick I get a black screen, machine does nothing... until I plug in the USB--then it boots right up! Much appreciated, it seems that the installation method keeps changing with Hexxeh's builds (which is annoying as hell) and I was worried this would be as difficult as FreeBSD. However when I got to installing RootFS (1.4.2) because of "losetup error:/dev/sdb/loop0: Check device isn't being used" or something like that. Same with Dell's April Build... It's a shame too, because this is the best that Chromium has ever been. Looks, feel, functionality, it actually works... errrr, sort of. Just so everyone knows, there is a solution to the black screen if you are installing the April 15 Dell build onto a Dell Mini. Please note that I did not come up with this solution, but I can confirm that it works! I hope this helps someone out there. I have an old Dell Lattitude C840 I'm going to give this a try on... Anyone else successfully boot to Chrome on a Dell 840? Dell C840 BIOS doesn't provide for a USB boot option! Can this be installed via a CD-ROM? I initially had trouble installing both the lime and vanilla builds on my Acer Aspire One A0A 110 like one of the previous posters. Running it from a usb flash drive worked fine but when I tried to install it to my 8gb ssd, the Acer booted to a blank screen. Based on the suggestions above, I downloaded the Dec 2, 2011 lime build and I was able to successfully install chromium os to my little acer. Right now I'm a happy camper b/c it does everything I need which is surf the web, check facebook and occasionally play a youtube video. Works perfectly for installing the latest Lime build on an ASUS EEE 1000HE. And he's got the WiFi working now too. Booyah. almajid, it sounds like chromeos wrote it's bootloader to the mbr. You're going to need your windows install disc to do startup repair. Try this: -start up from your windows install disk -hit shift F10 and type "diskpart.exe" without quotes of course -type "select disc 0" -type "select partition 1" which should be your windows partition -type "active"
and then quit. You should be able to boot into windows, if not just try doing startup repair a few times. Should it be possible for me to install Chromium OS to my Samsung NP-Q430 laptop? I've tried your instructions for the January 2012 and April 2012 dell images, as well as the latest Lime version. Farthest I've gotten is with the January Dell image. I'm able to install chromium to the HDD but when it loads, it blinks at the login screen several times and then goes to a black screen. Only thing I can do from there is ctrl+alt+f2. Any help is appreciated. Thanks! Thanks for the great advice... I installed successfully using the April 11th dell image onto my 10v and thanks to you got the wireless to work, just can't get the install to local disk to work. i've read articles and this sounds great. so.. which build would suit my inspiron 1300? I don't know if this has been said before, but the reason Dell's Chrome OS looks different is because that's what Google are now developing it to be. I believe Hexxah is in progress of building the version with movable windows. It says that there is no file or directory. I can create the new cfg file but it does nothing. ChromeOS-Lime-2237.0.2012_07_08_1610 Works with Eee PC X101, installed in HD, wifi up, better pad (still failing in scrolling with gesture moves), but....... ....not as fast as expected, despite de SSD, transitions betwen tabs are not as fast as i expected, most youtube videos ask for plugins, tabs freeze until you hit any key..... maybe lack of memory, the netbook only has 1GB, may try with other module see what happens.......stay tune. THANK YOU! Installed on Acer Aspire One aoa110 with 8gb SSD, got the black screen at reboot after install, but your posted solution WORKED. AMAZING. Thanks a ton! Hi! First: I'm so happy to read this important information. THANKS ! 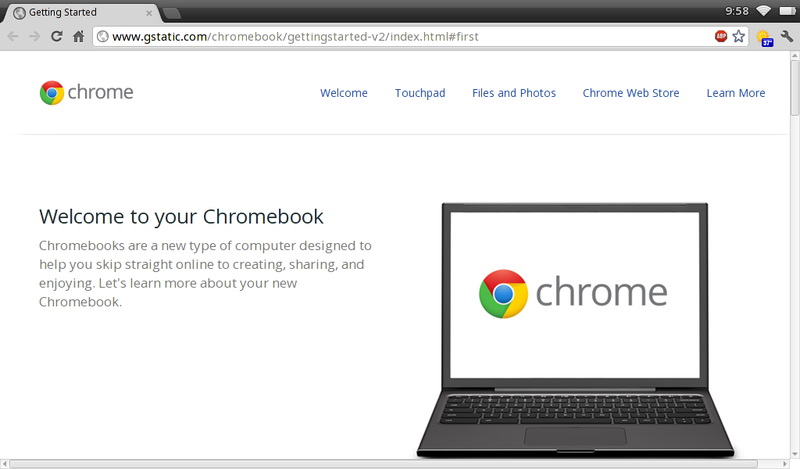 But, now I have Chromium (USB mode) in my netbook Exo (Don't know model). In this netbook don't work the wi-fi. 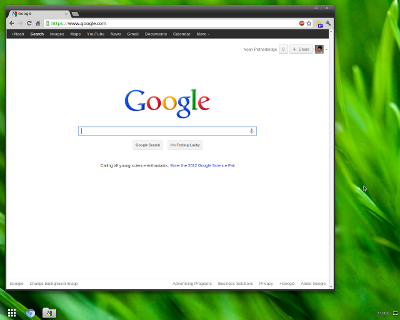 I search in Internet and now I have the Drivers for Windows and Linux.. Well.. How can I install it in Chromium Os Lime ? Exist commands for this? The driver for Linux is Tar.Gz.. Somebody know how install it ? Thanks for all ! For anyone having wireless issues. I couldn't see any network. Ethernet or Wifi. Using the Lime December 2011 build works and I see both networks. Shame its an older release however its the only build that works for me. I have an HP mini 210-1010nr with the broadcom 4315 wireless card in it. I was able to successfully boot with wireless support out of the box with the December build of Lime. Vanilla did not have the drivers at all, so no Vanilla builds worked. Any of the newer Lime versions did not successfully load the wireless drivers either. However, the December load of Lime does not have the groovy desktop that I find nice, so I ended up going with the April 15th image from dell image. I did get the blank screen after reboot and did have to use by Matt above (THANKS MATT!) for someone named ":)" above having a hard time finding the directory, instead of typing shell type bash to drop to a bash shell. Then manually navigate to the directory one level at a time, so "cd media, cd removeable" etc and use the bash tab key function to get there, then once you get to the External Drive level use bash tab completion and mess with the \ 2 until you get it. If you do an ls in the removeable directory you should see it there. The solution works. Additionally afaik the /etc/intall_wl.sh is only available in the dell version. Also make sure you are doing sudo /etc/intall_wl.sh so you have proper permission to modify the files. So the moral of story is use trial and error to find an image that works for you. Afterwards, a couple tweaks are required to get it to install on the HD. EDIT I got the april 15th version from Dell to load the wireless drivers just like the author, by running the sudo /etc/intall_wl.sh. I would also like to note that even though the December build of Lime loaded my wireless driver....it would not automatically scan for available networks and when I manually added an SSID the WPA auth failed. The April build from dell scanned the networks and has the cool UI that the author noted above. I am new to this. I tried both Jan and Apr'12 build on a 8GB stick (one at a time) and both time during boot give me the "Kernel Panic - not syncing: stack-protector: Kernel stack is corrupted in: 81671b33" message plus traces. Then the system stops. the only way out is power down. Appreciate if anyone has some advice on this. I am using Dell Inspiron Mini 10 with Dell wireless 1397. Worked perfectly. This was hard to find on the internet as you said. Thanks for figuring this out and sharing it with everyone. I loaded in on an Eee PC 1005HA hard drive. could not find 1 instruction that worked.. everything is little bits at a time. @steve: are you installing it from a USB drive? The "source does not look like a removable device: /dev/sdb" would sound like /dev/sdb isn't a flash drive (usually, /dev/sda is the internal hard disk, and /dev/sdb is the flash drive you're currently running chromium from). I'm trying to install this on a samsung seris 9 (np900x1a 11"). Most things work great, boots in 8 seconds and runs smoothly. However, I'm unable to get wifi working with the latest vanilla build, and the latest dell build won't boot. I tried installing the vanilla build and putting the dell build on a USB stick and poking around on the USB stick to find the install_wl.sh script, but I couldn't get it to mount anything on the USB stick. Also, I can't find the lime builds anywhere. It looks like Hexxeh is not making them any more, and I can't even find any of the older builds. Does anyone have a late-ish lime build they're willing to upload to some place so I can download it? Thanks for the Lime build link!!!! If you read anything about installing this to your HDD, if you did install it without setting it to dual boot, you wiped your Windows installation. If you did configure it to dual boot, boot from your Windows 7 DVD and do a system repair. I snagged the latest Vanilla build and works fine, but can't get wifi to work on my hp mini 110-3700. I've only been running it off the usb, do I have to install to hd before fixing the wifi? I don't know anything about linux, how do I fix the wifi? No luck running as dell but once I hooked it up to ethernet was able to log in with my google account and then bring up the shell to run the install. Wireless is now working but brightness and sound controls not functional, neither is sound at all. Not going to install it to HD as it's not functional enough to make it worth wiping my HD. but so far, so good. using the April build btw. I was hoping to try out Chromium on my HP Mini 210-1011EA so I put vanilla onto a USB. Unfortunately Vanilla doesn't detect my network, would I be right in thinking lime has better Broadcom compatibility? I tried to download it from Hexxeh but I can't locate a download . From what I can gather he appears to have laid Lime to rest for the time being so would anyone be able to point me to a copy or send on to me? I have a Sager 3300c with windows xp. I had to use plp boot manager in order to be able to boot from usb but after putting the chromos image to a usb and trying it, the system just stops. I have followed all the instructions and no luck. Even tried a couple of different downloads. I was thinking my system might not be compatible because of it's age, it is very old. Any thoughts? So, Lime is no longer available ANYWHERE. Any tips on how to get WiFi working on Vanilla? i tried doing that, the trouble is that when i have to put the password it wouldnt let me, i know its facepunch, but i couldnt type after putting chronos, tried an usb keyboard and the acer d250's onboard keyboard and it didnt work, please help! I want to try ChromiumOS Lime. but at Chromium > Connect, a "Continue" button disabled. what's sollution for this. regards. Trying to coax Lime to boot on Lenovo S205. From Nikos & Jo's posts above, URL for Lime build 2237 is as below. The download worked for me. Also there's a Dell build here from February 30th, 2013. (http://linux.dell.com/files/cto/) Following your steps in this build enabled full wifi support for me on my Dell Inspiron N5010. Also it has the newer, cleaner UI present in Hexxeh's builds. Everything works well after following your steps, thanks a lot for them! My touchpad acts a bit odd (mouse disappears a lot, low sensitivity despite setting it to highest in setting, two finger scrolling goes way too fast) but these aren't big problems really, a USB mouse would probably resolve it. Thank you! Your reminder of Ctrl-Alt-Fx for console got me thinking and where I had some screen flashing and an apparently worthless boot screen (still seeing Dell bios post messages), I now have a proper terminal for installing! Your instructions are great. I installed the Dell version on my HP 2140 netbook. Wlan fine, I love it ... Thanks a lot kirsle ! The same thing happens if I use the Ctrl-Alt-T window. I want to put this image on PandaBoard and boot it. Any idea, how to do it? I need your help. I use control t and install c.vanilla in my pc, Now i cant entry at Windows , how did to back ? I want to download the Chromium OS and wanna run in Virtual machine so anyone please send me links to download the OS. Links for the LIME build is no longer available. Does any one have a link for it? You are my favorite person today! Ty im gonna try this out! Anyone has any idea what to do?? I have Chomium Vanilla Installed on acer netbook... thanks to you my friend!! But how to download from Google Webstore?? How to fix this out of date issue? Download Rufus from here: http://rufus.akeo.ie/downloads/rufus-2.2.exe Use it to install to USB.